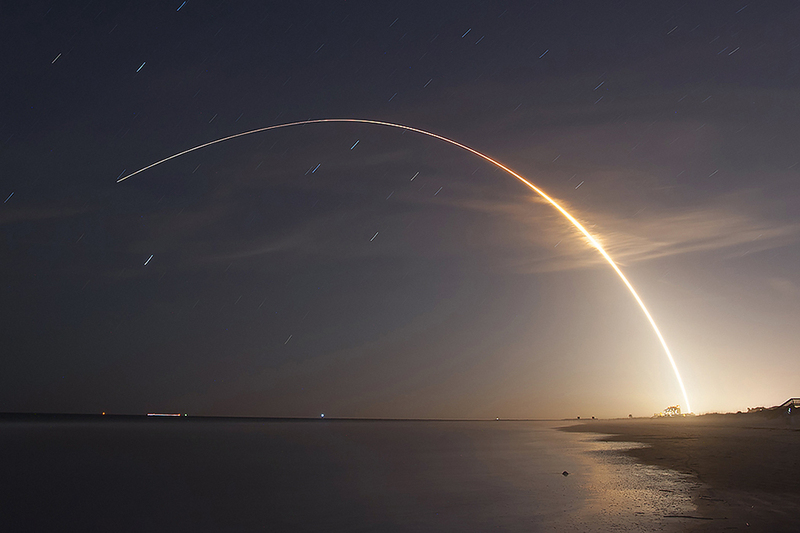 CAPE CANAVERAL — Four magnetic explosion probes in a towering stack atop an Atlas 5 rocket rode a fountain of flame off the launch pad and into Earth orbit Thursday night for a $1.1 billion NASA science investigation into a universal force of nature. The Magnetospheric Multiscale mission, or MMS, lifted off at 10:44 p.m. EDT, marking the 20th consecutive Atlas mission to fuel-and-launch on a single countdown attempt. Featuring a pair of solid rocket boosters to augment the million-pounds of thrust from the main engine, the vehicle quickly accelerated away from Complex 41 and arced over the Atlantic, headed downrange to a highly elliptical Earth orbit for MMS. 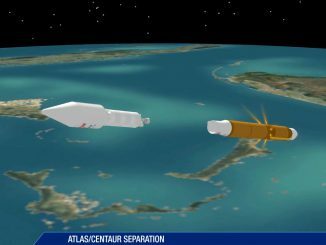 After staging four minutes into the flight, the single-engine Centaur upper stage ignited for the first of two burns needed to achieve orbital speed and then to create the egg-shaped orbit for deployment. 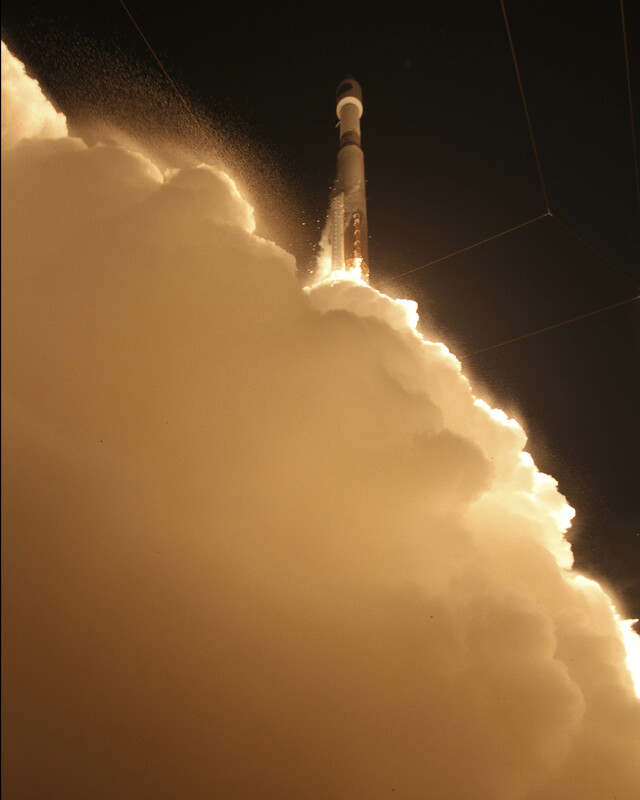 Some 92 minutes after liftoff, flying over Baja California, the first spacecraft was released. The remaining observatories were separated at five-minute intervals to spin away on their own as the rocket passed above Mexico and the Gulf of Mexico. It was the 53rd successful Atlas 5 rocket launch and the 12th for NASA. 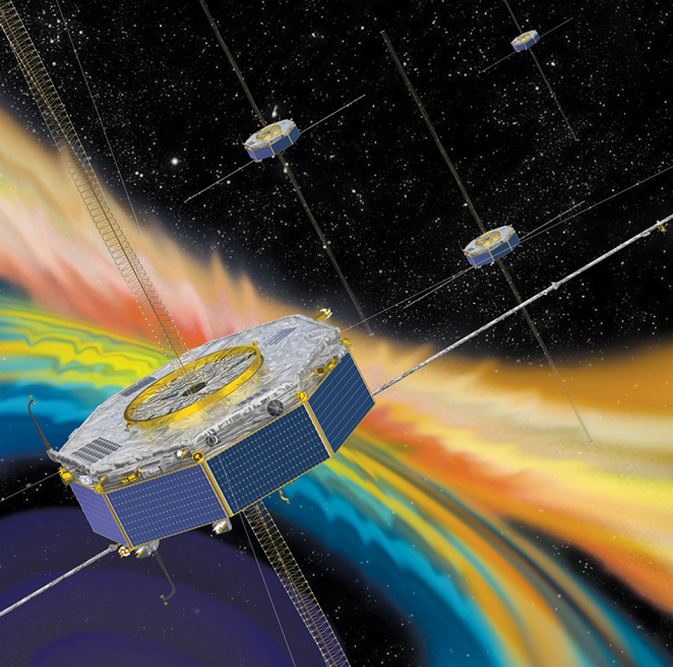 The satellites will stay together in cosmic terms, formation-flying around the Earth in a carefully choreographed dance to gain three-dimensional insights into the fundamental processes responsible for transferring energy from the solar wind to Earth’s magnetosphere. The laboratory for this experiment, a 1,600 by 43,500 mile orbit, promises to teach scientists about how and why magnetic reconnection occurs, which is the explosive disconnection and reconfiguring of the magnetic field lines. Going into the magnetic field should provide sustained study of this process. “With MMS, we will have the first chance to watch magnetic reconnection from the inside, right as it’s occurring,” said Jim Burch, vice president of Southwest Research Institute’s Space Science and Engineering Division and principal investigator of MMS. The magnetic reconnection is a process that occurs throughout the universe, including when solar flares erupt from the sun, in planet formation and here on Earth in fusion reactors. “This research is also important for nuclear fusion research, where magnetic reconnection has proven to be a serious obstacle to tapping this potential energy source,” said Burch. The spacecraft instruments include plasma analyzers, energetic particle detectors, magnetometers and electric field instruments. 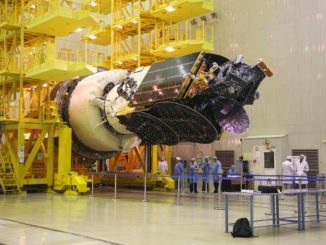 Each satellite will extend wire-like antennas, magnetometer arms and booms, making them about 94 feet tall and 369 feet wide in space. “The name doesn’t describe it as well. We should be calling it the magnetic reconnection mission,” Burch added. The formation-flying will take the shape of a tetrahedron, with the satellites starting out at 62 miles apart per spacecraft and then closing to 6 miles. “You can’t just drive it like a car. You have to insert delta V and fire the thrusters at certain points in the orbit,” Burch said. MMS promises to give scientists millisecond cadence to data-collections while probing reconnections where they happen, making measurements 100 times faster than before. “Picture watching a football game and you can watch a minute at a time, but you have to wait an hour between times you can watch. It’d be really hard to figure out what’s going on in the football game,” said Paul Cassak, associate professor and plasma scientist from West Virginia University. 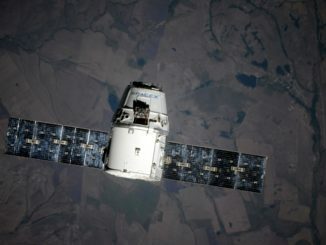 The complexity of the mission, likened by Brent Robertson, MMS deputy project manager, to flying to Mars, prompted NASA to build and operate it in-house at the Goddard Space Flight Center in Maryland. The probes should be commissioned and ready for science by September. The next mission for United Launch Alliance is planned for March 25 featuring a Delta 4 rocket carrying a Global Positioning System navigation satellite. The next Atlas 5 launch targeted for May 6 to return the X-37B spaceplane to orbit.